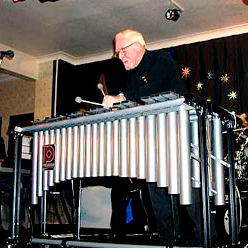 Tony Harris has been a well-loved jazz musician in Plymouth for many years and with sons Paul and Dennis forming the Tony Harris Quartet. Tony is a great vibes player and improviser, able to turn his hand to many styles of jazz. With sons Dennis on drums and Paul on keyboards they make a great team with instinctive understanding of what each is doing. Over the years Tony has been able to complete the quartet with some of the South-west’s finest bass players, including Mike Thorn, Kevin Sanders & currently Jim Rintoul.